2016- a train currently operated with a driver and conductor. Until I scrolled back through my archive to write this post I had not quite appreciated that it was as long ago as July 2016 the I wrote about the continuing strikes on Southern which had led to the implementation of an emergency timetable to cope with traincrew shortages. 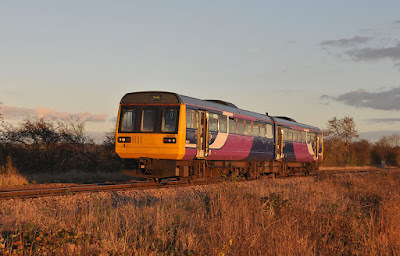 Since then the industrial dispute between the RMT, ASLEF, the train operators and ultimately the government has developed. Several other companies have joined the Southern employees in industrial action with Abellio Greater Anglia, Merseyrail, Northern and South Western Railway now all engaged in coordinated strikes through the RMT union. The reasons for the action have not changed- a threat to the safety critical position of train guards who currently operate train doors, an extension of DOO (Driver Only Operation) and a threat that the guarantee of a second member of staff on many trains may be eroded. The latest company to be added to the ever expanding portfolio of RMT industrial action is First/MRT owned South Western Railway which took over the running of services from Waterloo from the Stagecoach South West Trains franchise in August. SWT was one of of the last operators to run all services, including inner suburban routes with a guard and many see it as unsurprising that SWR are considering changes. A new fleet of Bombadier 'Aventra' trains will enter service on the network from 2020 and SWR officials have stated that a decision has not yet been made on the method of operation of these trains. While there is no immediate threat to the role of the guard on SWR the company has failed to put in place an assurance that a second member of staff will be retained in all circumtances stating simply that any changes to current practices would be consulted in the usual way. While the strike on SWR will bring disruption to passengers out of Waterloo this week there may finally be light at the end of the tunnel for the long suffering users of the Southern network with news that a deal has finally been accepted by ASLEF drivers bringing an end to their dispute. A generous pay deal will see Southern drivers accept an increase in DOO services with an assurance that a second member of staff, the 'On Board Supervisor' will always be provided on trains except in exceptional circumstances. Exceptional circumstances would appear to include late notice sickness - a position the RMT, representing the guards is still unhappy with and continues to dispute with Southern. It is however the drivers strike here which has been most disruptive and an end to which will be welcomed by passengers. run a full service using contingency guards. Strikes undoubtedly have their place in the industry but the disturbance they cause must not be forgotten. Not only do passengers suffer but general morale within the workplace is stretched. Those staff who are still working, many of whom are not involved in the strike are placed under strain and an air of unease and tension can easily descend across the industry. The company which I work for has now been brought into the dispute and I am beginning to see first hand the intricacies that strikes bring to an industry from behind the scenes. The extra workload for staff, the tension from the public, the strain on relationships and the balance between obligation and duty. For example the many company managers who have no choice but to break the strike by forfilling their obligation as contingency guards while their friends and colleagues man picket lines. My role is is not directly involved in the current strike, but how do I feel about operating the railway when my colleagues are striking? On one hand I hope that our contingency service provision runs well in the interests of our passengers and all who are working hard today to keep trains moving safely, reliably and without incident. But then there is the other side that maybe 'secretly' hopes that it will all go wrong. There could be incidents involving our contingency guards, service levels may fall below what we expect and passenger journeys may be disrupted beyond the provision set out in the emergency timetables - the impacts of the strike would be felt stronger and enhance the case which RMT guards are presenting. One thing is certain - as I have said before, parties need to talk. As an industry we need to innovate, but we do not need to innovate purely for the sake of change. The number one priority of the rail industry must always be safety and in my view a second member of safety trained staff on board every train can only be positive in this respect. Are trains with DOO safe? Yes. Of course they are. Would they be safer with an additional member of staff who can assist passengers and is safety trained in the event of an emergency- undoubtedly. This week Londons Evening Standard newspaper totally missed the point when they their story 'On the day before rail strike over driver-only trains, RMT boss Mick Lynch travels to work... on driver-only train' featuring a picture of the RMT assistant general secretary travelling to work by train and chastising the leader for his hypocritical actions. The suggestion presumably is that it would be more acceptable for Mick Lynch to drive to work, take a helicopter or simply not travel at all rather than using the mode of transport for which his union has worked for many years to keep safe. Mick Lynch has rebuffed the comments stating that 'by holding a strike we're trying to increase safety standards on the railway. They [DOO trains] are less safe than a train with a guard'. There is no suggestion that DOO trains are not fit for use, or that it is a risk for passengers to use them. Rail remains the safest way to travel- but why not make sure it is the very safest it can be? All views expressed are my own and do not represent the views of my employer.